Today we're entering into our second week of Anything Goes & Such A Doll at Art With No Boundaries. We've already gotten a lot of cool entries and we're looking forward to seeing even more before this challenge is over. 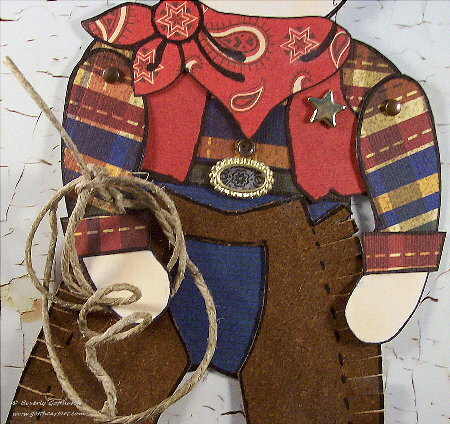 My team mates have out done themselves this time around with lots of cool Old West interpretations of The Sheriff Doll template at CS Designs. Chris is known for her innovative designs and she hasn't disappointed us with the new releases she has brought out during this first part of September. 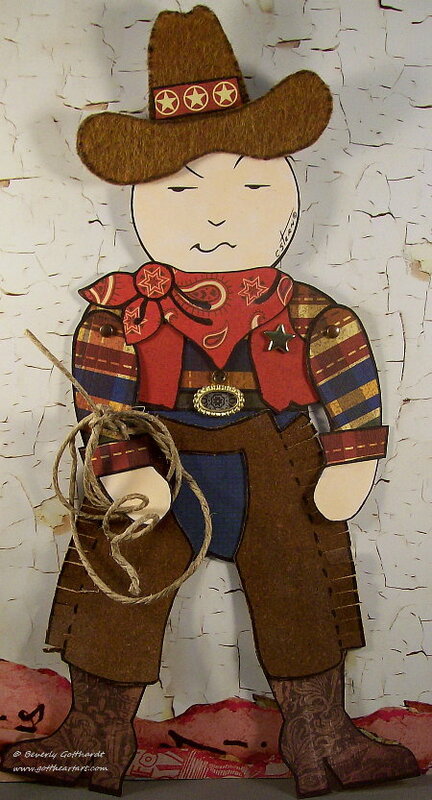 Sheriff Joe here is ready to go out and gather his posse together to lasso some bad hombres. I used a few brads on the Sheriff. Every cowboy worth his salt has a huge belt buckle and I created this one from an oval jewelery piece and some pattern paper. 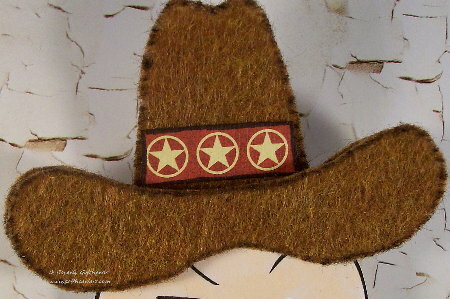 His hat is cut from felt, and his chaps are created out of some leathery self adhesive paper I found. I cut the fringe on the sides with some shredder scissors. The rest is pattern paper. These Art Doll templates are so much fun to work with and when you pop over to see what the rest of the team has created you will see some quite different uses we all came up with for our creations. Come on over y'all for some fun as we finish up the first 2 weeks of September. Sheriff Joe is just awesome. Love his plaid shirt and those chaps are hilarious. Great use of textures in the felt, fringe, and leathery paper. I love him! Your Sheriif looks fantastic. I love his felt hat that scarf and the belt buckle. He looks like a real cowboy. So cute - love his bandana and that wonderful felt hat! Sheriff Joe is just to cute. His felt hat is so wonderful and his clothes are very fashionable. He's absolutely wonderful Beverly. You did an amazing job in creating him. Beverly, I just love your Sheriff Joe, he is just too cool for words. That is some fantastic out fit he has on and his lasso is such a great accent. You have a wonderful imagination and a great eye for detail. Simply awesome.